The High Court defended voting rights yesterday—striking down part of an Arizona proposition that nevertheless leaves undocumented immigrants vulnerable to deportation. The Supreme Court defended voting rights yesterday when it struck down Arizona’s requirement to present proof of citizenship when registering to vote. But while the decision relieves registrants of an unnecessary burden, the rest of the proposition that brought it into being remains intact. 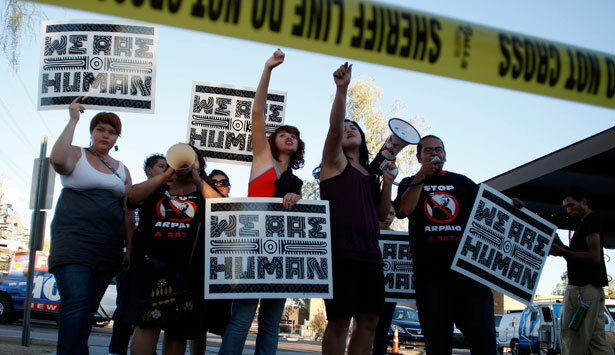 Arizona’s Proposition 200 attacks not only voters but immigrants as well. Despite a win for voting rights yesterday, undocumented immigrants will remain especially vulnerable under the law. Created twenty years ago, the National Voter Registration Act, also known as Motor Voter, was approved to encourage voters to register—and also mandated that states use a matching federal form in order to keep registrations consistent. About ten years later, Arizona voters passed an anti-immigrant and voter suppression proposition backed by the hate group the Federation for American Immigration Reform. Among other provisions, Prop 200 required voters to issue proof of citizenship in order to register—in violation of Motor Voter. It was that portion of Prop 200 that was struck down in the high court Monday. But Prop 200 went further in its attack on voting rights—demanding that voters also provide voter ID. It also mandates that those seeking certain public benefits establish their eligibility; if they cannot, then state, county and city workers can be fined $700 for providing services. In Arizona, Prop 200 has meant that immigrants who use certain healthcare services, or even public pools and libraries, can be reported to authorities and find themselves in deportation proceedings. Aside from keeping a harmful voter ID provision in place, Prop 200 has also meant that undocumented immigrants who might use public hospitals to test for non-life-threatening services—such as testing for communicable diseases—might be reported to authorities and face possible deportation. Any public service that is not provided by the federal government requires proof of eligibility, which has meant that undocumented immigrants avoid certain services that would keep them healthy in a state in which they, too, work and pay taxes. If they do use those services, they may find themselves separated from their families and from Arizona—a place that, despite its criminalization schemes, they call home. Yesterday’s victory in the Supreme Court should still be celebrated—but only cautiously so. After all, the same Court may still deal a blow to voting rights soon in another case that challenges the Voting Rights Act. And we should be vigilant, because while it took nearly a decade to strike down a portion of the law that went after certain citizens who vote, there is no current case challenging the other dehumanizing portions of Prop 200, which keep Arizona’s undocumented immigrants in the shadows. What’s missing in the debate on food stamps? Read Greg Kaufmann’s argument here.